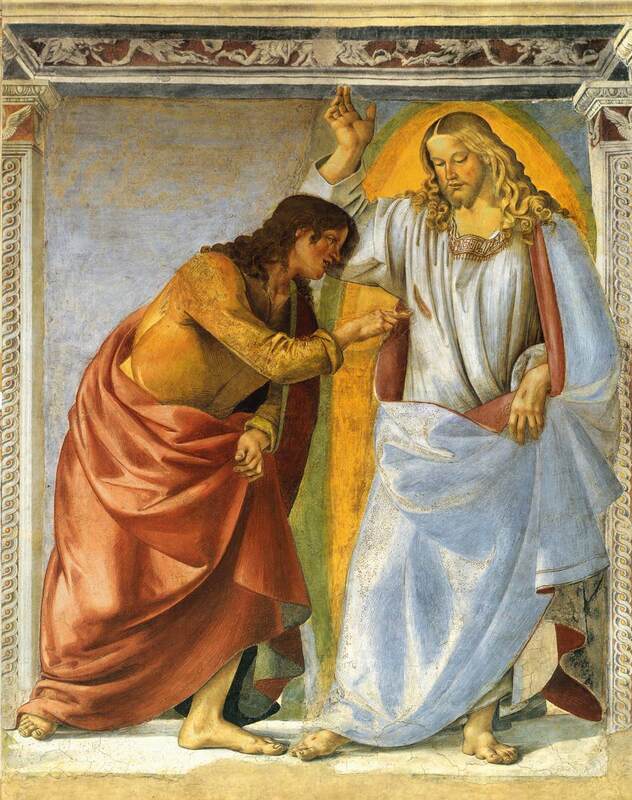 Doubting Thomas; Luca SIGNORELLI; fresco; Basilica di Santa Maria, Loreto, Italy. Two men are in a space closed by a curtain. Jesus is risen. He is clothed in light. He has raised his left arm to show the wound in his side, the one made by the stroke of spear appearing through a hole in his shirt. The marks of the nails can also be seen on his hands. The apostle Thomas leans to touch the wound in the side and put his right hand into it; he does not look at Christ. The scene generally takes place in a closed room where the apostles and, sometimes, the Virgin are present. But Thomas and Jesus can also be found alone. Christ is wrapped in a shroud-shirt but in a way to show his wounds, or he is bare-chested. 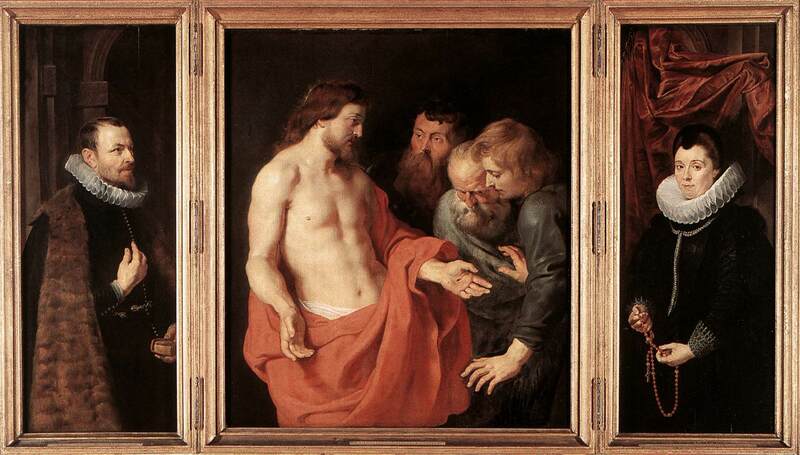 Jesus shows the wound in his side and he invites Thomas to touch it. In the text, there is never any mention of the marks of the nails that are however visible. Thomas is often standing or kneeling; he either turns his eyes towards his Lord like Magdalene, or he is fascinated by the wound into which pictorial realism leads him to thrust his finger. (see Apparitions to Mary Magdalene). 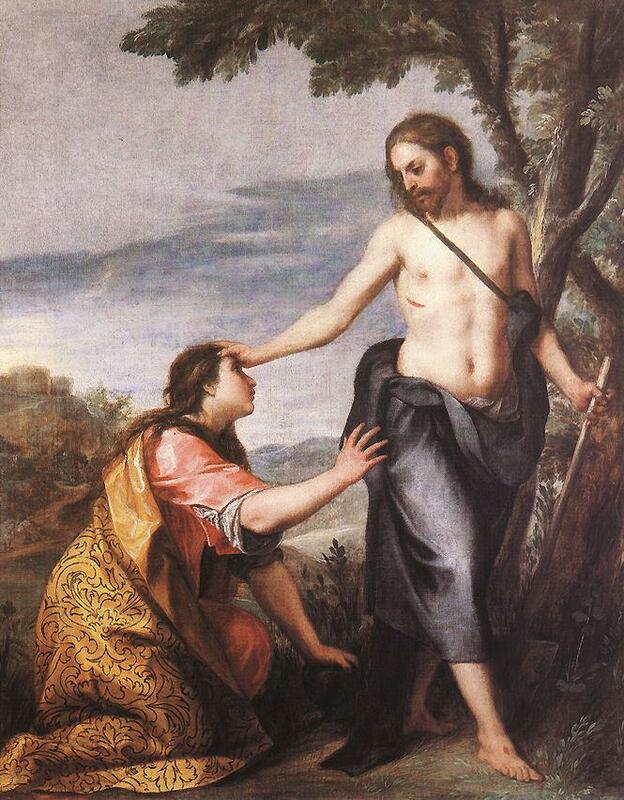 Noli me tangere; Alonzo CANO; circa 1640; oil on canvas; Museum of Fine Arts, Budapest. The apparition narratives show how Jesus gives himself to be seen to the witnesses he chooses, in order to strengthen them in their certainty that he remains with them. They must recognise the crucified Christ of the Passion in the risen Christ of Easter. The scene takes place among all the apostles who themselves have believed at the previous apparition. Rembrandt adds the Virgin Mary and emphasizes Thomas’ profession of faith in Christ, the true source of light. The Incredulity of St Thomas; Giambattista CONEGLIANO; 1502; oil on panel; National Gallery, London. 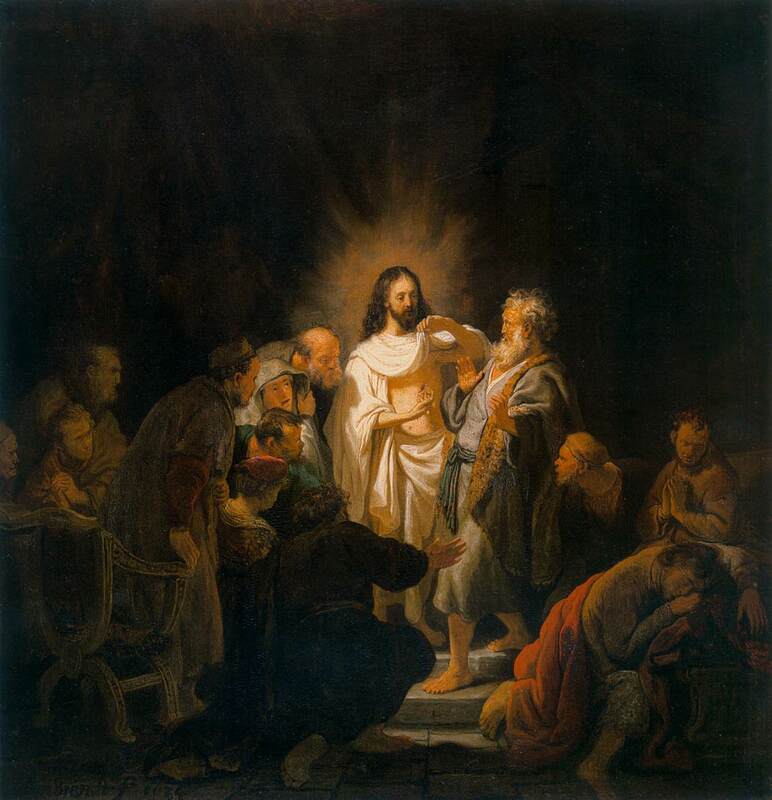 The Incredulity of St Thomas; REMBRANDT; 1634; oil on wood; Museum of Fine Arts, Moscow. The realism of Thomas touching Christ’s wounds is more or less pronounced. Caravaggio gives a disquieting dimension to the scene. The Incredulity of St Thomas; CARAVAGGIO; 1602; oil on canvas; Sans Souci Palace, Potsdam, Germany. The Incredulity of St Thomas; Peter Paul RUBENS; 1614; oil on canvas; Koninklijke Museum voor Schone Kunsten, Antwerp, Belgium. Medieval art standardizes the gestures of Christ and Thomas but gives priority to the exchange of the two glances. 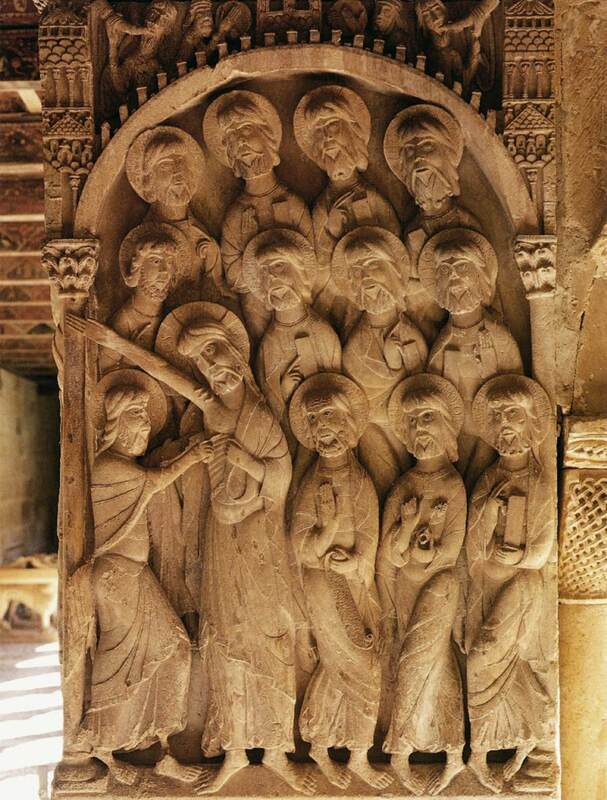 What a magnificent composition the group of apostles is at Silos. The Incredulity of St Thomas; circa 1200; miniature on vellum; manuscript KB 7 F 5; Koninklijke Bibliotheek, The Hague. and his quest for tangible proofs have remained very popular, hence the phrase “to be like St Thomas” which means “to be always doubting”. His reputation for doubting has been such that a legend says that at Mary’s Assumption (see The Woman of Revelation) as he was still absent, she let her belt fall to convince him she had risen to Heaven.